After picking up my 72 TC Europa a couple weeks ago, I've been scouring the internet, searching forums, downloading articles, reading everything I can in preparation for the restoration. I had to decide between a like-new-from-the-factory restoration, or a restoration/upgrade-for-driveability, and I decided upon the latter. Having made that decision I began ordering parts last week and yesterday the first 2 boxes arrived! I now have Spax shocks, springs, new headers-pipes-muffler (the old ones are completely covered in rust), new interior door handles, a complete set of polyurethane bushings for the suspension, new outside badges for the sides and rear, new valve cover gasket (the old one has a slight leak), a new air cleaner duct, a new air filter (there wasn't one in the car to begin with), and everything is laid out all over my living room floor. And more boxes of stuff are on the way! Looks great! Except...there isn't a single piece of instructions that came with any of it. Most of it is fairly basic and straightforward and I'm sure I can figure out how to install most everything except for things like torque settings and adjustments. Tomorrow I begin the work. Anybody have experience with/installing any of the suspension components? Especially bushings, springs, shocks? Any tips or advice? I have three large boxes of Europa parts in my dining room right now. Very similar to yours, but I have a lot of motor internals and gaskets and such as well. Which exhaust have you chosen? I'm trying to decide between stainless or coated. Fortunately my engine was recently rebuilt so that's one area I don't have to get into. I simply chose the headers/pipes/muffler that R.D. Enterprises has; they're coated. It's a paint though; I may have them stripped and ceramic coated which helps to cut down on engine compartment heat. 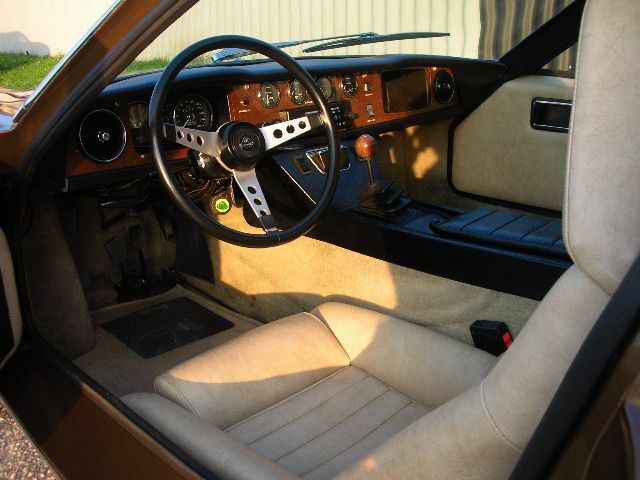 Didn't you buy that gorgeous JPS Europa with that killer custom interior? Yes she's in our garage now. I've placed her for sale but may not do it. Seems I've developed a crush for an Evora. Need to make some garage space, and have decided to offer my track oriented Elise. Only been offered since Saturday, have spoken with a few people but nothing done yet. So maybe I can wedge an Evora in where the Elise is now, allowing the Europa to stay here with us. It's a wonderful car and I would LOVE to see her made right as she can be. I'm definitely looking at coated exhaust. Ray at RD told me he's not seen good fit with stainless. Sounds like we may share some good conversation in the coming weeks? Months? Years? If she stays here she won't get to the restored until October, after the show at the Greenville SC BMW plant. I have a Stainless Steel Exhaust from RD and it seems to fits well. It was on the car when I bought it though. I still have the original headers on the engine, and two exhaust pipes come down from them, and into one pipe than through the exhaust... See pics. Hope this helps. From the way the car looks on the outside and interior, I assumed it was in perfect condition, but now I'm guessing it needs engine work? When you say "right as she can be" what all needs to be done? Yes indeed we may very well share some good conversation. I'm planning my project to be in the JPS color scheme so it will be somewhat similar in appearance to yours, which is the best looking JPS Europa I've seen so far. I've been studying the Lotus 72 F1 cars for color scheme ideas to make mine look more like it belongs in the stable with the Lotus 72 so I'll be changing the wheels and using Talbot style outside mirrors instead of the Sebring style, as well as some other small changes. The headers I received from RD look slightly different but they're a nice design; pipes 1 and 4 collect into a single pipe, pipes 2 and 3 collect into a single pipe, then those two collector pipes go into a 2 pipe collector which combines everything down to a single pipe out. I'll post a pic tomorrow. I'm probably going to get these ceramic coated since I know mild steel is prone to rust issues and these cars for some reason seem to really have a vulnerability to rust in the engine compartment. Seems like every pic I see on the internet has rust all over the place back there. Unfortunately, for every part you remove to install a "NEW" PART you will find at least two, in the immediate area, that also need attention. Your mind & work ethnic will not allow you to continue without addressing these newly found discrepancies. You will ruminate about them, and eventually dream about them as you sleep. They will prey upon your mind, until you remove the previously completed repair to access the faulty items, and remove them, upon removal, you will finf several other minor bodges that cannot be allowed to stand un corrected, even though that are minor or cosmetic..... Their correction leads you to another, and then another . As the process continues, minor surface corrosion becomes evident, not a huge deal, but one that cannot be corrected properly without removing suspension components. Then you find wear in the fasteners and bushings. welcome to the world of Lotus Europa resurrection! It CAN BE FUN & REWARDING! It is nice to see such a flurry of Europa activity. Wonderful, beautiful cars. They are what turned me on to Lotus back in the day. I started mine about 2 1/2 years ago, a TC restored as a driver. The existing shocks roll sorta like a boat. Move an inch when I get out of the car. Disconcerting in the turns! New springs will lower a bit especially in front, looking to better the motorboat inclination of a federal car. adjustable Spax. Some gauges don't work. Some indicator lights are, confused. Rebuilt the speedo, it jumped. Perfect and awesome looking now, makes tach look old and faded. It's next. Plenty leaks at transaxles, some from various points of the motor. Starts right up, pulls well, no smoke. But 57,000 miles, 37 years old, I'm running out of cardboard to keep under her. What differnces in appearance are you thinking. 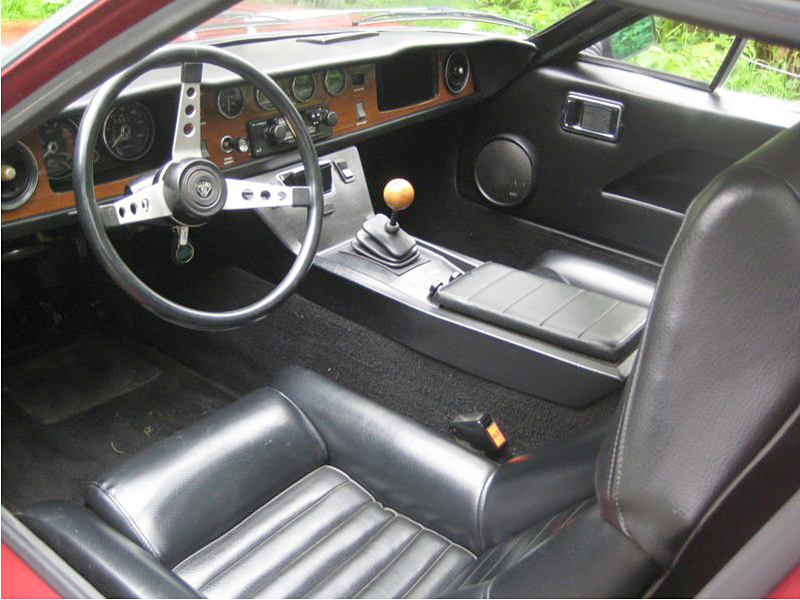 The PPO (prior-prior-owner) did quite an effort with the JPS configuration, I'm quite interested in the details. I've also been tempted to place a smallish Union Jack somewhere rear of the front wheels like every British car I've ever had. But the lines are so perfect as is. The old vintage radio needs some refurbish. I require analog, turn the knob to tune, but need connectivity to my Droid. I picked up a nice Radiomobile unit, only to discover it's mono. Any one need one? I'd like to have an exhaust built to the quality of what's on my Elise, from 2ubular. Many others have some beautiful stuff too. Throttle is way stiff, quite difficult to modulate. Brakes may be typical of the period, but they have zero modulation, Work OK, but feel like you are pushing a heavy couch across a carpeted floor. Suspension bushing and such are likely worn. This whole thing makes me realize that parts and info are hugely more available for a modern car. Just pull out the credit card, wait for the mail, bolt on. Putting brake upgrades on an Europa looks like fabrication of almost unique parts. Geez. Am I up to it, we'll see. Sure does not sound like someone looking to sell the car! Last edited by XHILR8N! ; 07-01-2011 at 10:05 AM. Oh wow lol, and here I thought you had the perfect Europa based on the looks! They all seem to have their own unique quirks, don't they? I've managed to remove the shock/spring and lower link from the rear driver's side, got the old bushings out of the lower link. The car has old Koni's on it. I put the Koni and the new Spax shock/spring on a weight scale and the Spax is about 1 1/2 lbs lighter. The old Koni weighed 8 lbs 4.4 oz, the Spax weighs 6 lbs 12.6 oz. Saving 3 lbs on the rear suspension is a nice little bonus. I've used paint remover and stripped all the old paint off the lower link and found minor rust/discoloration under the black paint. I've gone over it with WD-40 and steel wool and it looks pretty good now. I've decided not to paint it black again, but to just clear-coat it. Rust can hide under black but it can't hide under clear. I have a very small amount of oil under the car that's apparently coming from where the axle shafts go into the trans. Looks like I'll need to replace the seals there. When I went to unbolt the exhaust system I was quite surprised to find out it wasn't bolted to anything in the back! The pipe is literally resting on the suspension cross bar which explains the loud metal-on-metal banging I heard in the back when going over any kind of bumpy surface on the road. 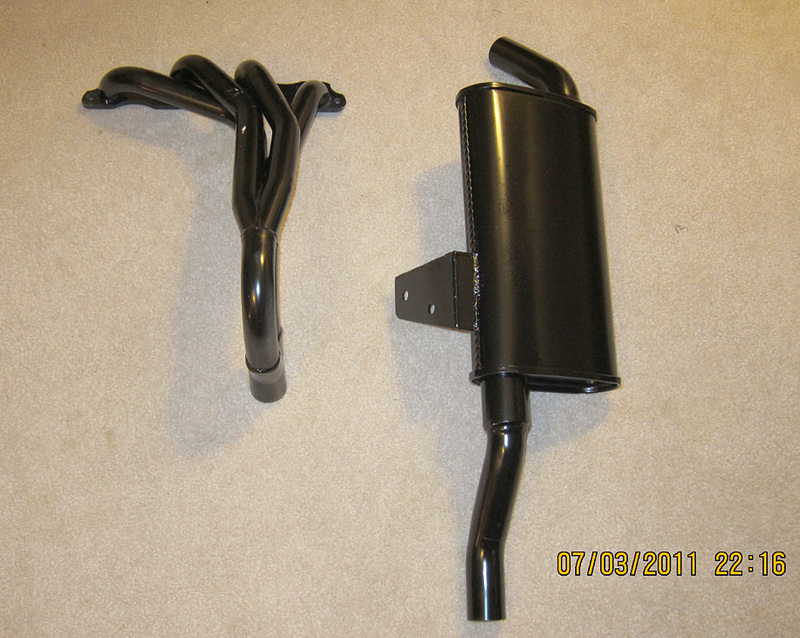 The new exhaust system will of course be properly bolted and secured. It will also undoubtedly make the car quieter too once the exhaust system isn't sitting directly on the chassis and transmitting noise throughout it! The air cleaner can that holds the air filter is in pretty good shape, just has some rust inside. I'm going to strip the paint off the whole thing and repaint it gloss black. Same thing with the air intake piece on the carbs (I have the Strombergs). Got a new duct hose and air filter element to make all that assembly ship shape. I'm fairly fortunate in that all the gauges work and the lighting is all functional. There's just a slight issue of the speedometer needle jumping up and down over about a 10mph range instead of holding steady. Don't know if it's the cable or the speedo that needs fixing but that's the only instrument issue. I haven't gotten into the front yet; I'm working on the back of the car for the moment. My biggest challenge right now is the heat; it's in the high 90's outside and that makes it impossible to work on the car because the heat in the garage is too much. I can only work on it late in the evening when it's cooled down enough to be workable. I'm looking forward to getting this driveable to see how it's going to be compared to what it was when I first picked it up. Driving it from Seattle to SoCal was an ordeal to say the least lol. It would not hold a straight line; it kept hunting from left to right to left and required constant vigilance on my part to keep it going in a straight line. The engine ran good though with plenty of power; the trans was good and the brakes were good, although like yours the pedal effort is so high it feels like I'm pushing on the brake pedal of a Patton tank. I was hoping to have the back end done in the next few days but the temps are supposed to hit over 100 the next 3 days so it's going to take longer to get things done than I'd like but that's the way it goes. I hear ya about tracking down parts; it takes much more research and effort to find the things you need for a car this old but at least I only have to do this once. Nice job of restoration! Anything you didn't do during restoration that you now wish you had done? Hey Roger. Could you give me a diagram of the fuel vapor lines and crank case breather? I am trying to figure out how to run these. Did you hook up something to the fuel tank vents? Where did you get the Vapor canister too, or did you have someone make it? Or is it an oil catch can? I wish I'd done an engine rebuild at the time - that's my next project when I've finished the engine rebuild of the Elan. I'm not 100% happy with the interior, either, though it's fully functional. I think the vinyl I used wasn't good enough. Fuel vapor lines? Let's see now......no, can't recollect any of those. No vapor canister either. Such things are not expected in Texas with cars over 25 years old. Breathers are one from normal crankcase, additional cam box breather at the front, both leading into a cheapy catch can with suction from both carb pancake filters. I've tidied that up somewhat since the photos, but it's the same in principle. There is a square receiver on the speedo where the cable ends. It was worn sorta round and the cable slipped when the force was larger. Nissonger rebuilt the speedo and it works and looks perfect. Okay I know exactly what that is; my old Triumph Spitfire had that kind of speedo. A white nylon receptacle with a square hole which wore over time until the metal speedo cable would slip instead of grip. Why they didn't make those receptacles metal I never understood. EuropaFan. Thanks for the Pics! The Exhaust looks great! 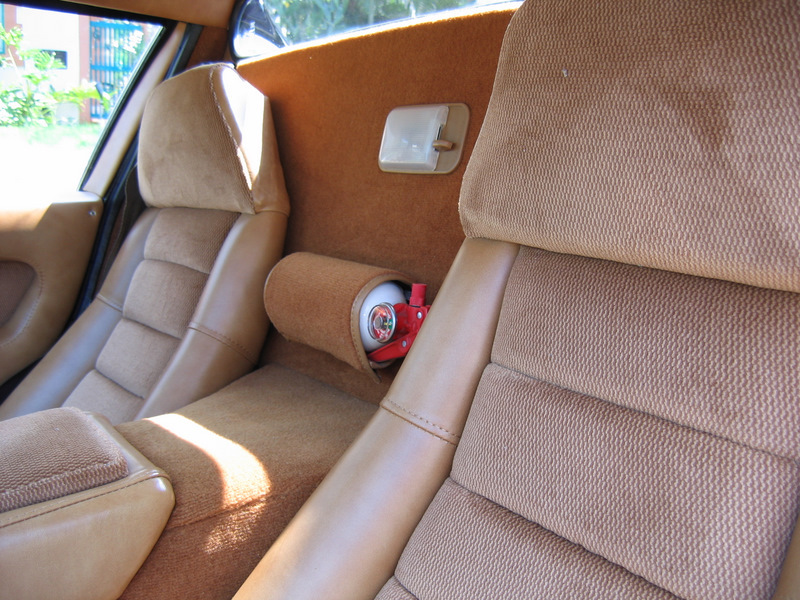 I like your interior. That is how mine will be when I get done with mine. Is the color of your Europa Regency Red? Mine is black right now, but the original color is Regency Red, and my dad wants me to paint it that color instead of Blue. Do you like the color? I think I will paint mine that color, just because its the original. Yes mine is Regency Red but it's so faded and washed out it looks pretty sad. I imagine it would look really classy in that color with a brand new paint job and a good glossy clear coat. I'm doing mine in the black and gold JPS colors but if you get yours done in Regency I'd sure like to see the finished pics!